Do you remember your college days when you cooked simple meals for yourself in your dorm room? Or that camping trip when your mother prepared delicious fish on that funny teeny tiny portable stove? Or that time you renovated your kitchen as newlyweds, so you had to come up with a plan how to cook for days? What was that piece of appliance that helped you back then? Correct! It was the hot plate. Now, my friend is organizing meal prep seminars, and she decided that the hot plate would be the best solution. A portable stove would make it possible for her to demonstrate her cooking techniques on the spot quickly. She asked me to help her pick the best hot plate, so we tried a few, and I used that opportunity to write these hot plate reviews. What to expect while using Hot Plate? Before we dive in, let’s define what are we looking for. The hot plate is a portable heating source used for cooking. It is usually powered by electricity (such as electric grill, electric griddle, and electric skillet) or gas. Hot plates are most often used as a substitute for kitchen stoves or convection ﻿﻿ovens. It can come in handy in the woods, basement kitchens, on your travel, patios and so on. Electric Hot Plate – the kind of hot plates we’ll be testing. They include self-contained heating element and allow you to control the temperature. These appliances require some time to heat up and to cool down. Ceramic Hot Plate – work in an entirely different way. To heat the plate up, you need to put it in the microwave, at a high temperature, for not more than five minutes. Then, you get it out, and you can use it for about an hour before it cools off. They are often used for scientific purposes. C﻿ast Iro﻿n Hot ﻿plate – You place the plate above the heating source, wait for it to heat up and then use it. I like to sometimes use this instead of the regular barbecue. 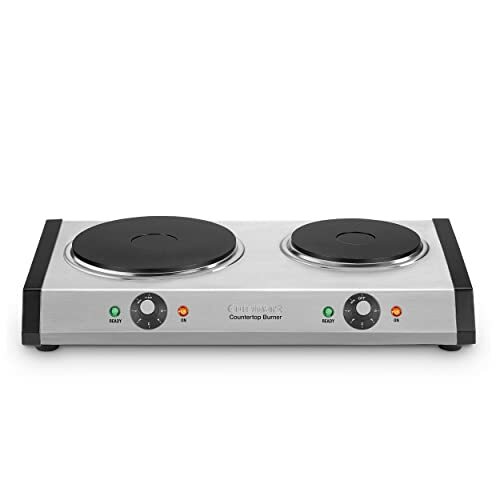 Induction Hot Plate – these are the only ones with the cold-to-touch surface, they heat just the pot the food is in, by using magnets. Induction cooktops usually include a lot of practical features as timer shut down, child locks and so on. Propane Hot Plate – is the kind of gas powered hot plate. It creates an open flame to heat the food. Very useful in case you don’t have or don’t want to use electricity. Which hot plate you will choose, depends on your personal preferences and needs. I like the electric or induction ones the best because I favor simplicity and effectiveness. Also, I don't like my hands to get burned and I think I would have that risk with other options. There are a thing or two you should know before you start using a hot plate in order not to declare a perfectly good appliance broken. Hot plates release smelly fumes the first time you use them, because of the chemicals they are coated with during manufacture! So, be smart, go outside and then turn it on. Do not cook anything on it before you do this first ride because your food might smell too. Many electric hot plates turn off when they reach required temperature and turn back on if the temperature falls beneath the desired level. They do this to save you energy and prevent overheating and potentially burning something. Similarly, some of them have a thermal fuse, which will turn off the product when it starts overheating, so you need to clean the place around it, no towels, mops or any other cloth near the hot plate. Hot plates do not have a long lifetime. They are not made for excessive use. You should use them from time to time, not depend on them. This is the main reason they are so cheap, so you can replace them when the time comes. Your hot plate may serve you for a year or two, or maybe a few years if you are lucky, but don’t expect you will use it for a decade. On the other hand, their design is simple, and they are fixable. So if you don’t want to buy a new hot plate every few years, you can repair your old one. There are easy ways to determine what had gone wrong, and how to repair it. If you are a handy girl, you can do it yourself, or you can ask your husband/son/father/brother for help. My friend and I handpicked five top hot plates with various features to determine which one is the best for cooking and won't let her down in front of the audience. She insisted on beautiful design and light weight, while I insisted on practicality and ergonomics. This single electric burner is an incredibly cheap product, so I know many people who have it, and they are mainly satisfied. For a small amount of money, you get a possibility to cook in your office or outdoors and control the cooking temperature. IMUSA also gives you the saving space design, which can be convenient if you lack the storing space. It shuts off when it reaches wanted temperature and turns back on once it starts cooling down, so it saves energy. This is a pretty good thing especially if you are using it outdoors and powering it by the generator. Also, it has power indicator light, so you’ll know when it is heating and when it’s not. On the other hand, this shutting on and off process may slow your cooking, so you have to be patient. What I particularly liked is that it is fast enough and it can facilitate 10 or 12-inch big pots and pa﻿ns (i.e., the 12" Red Copper frying pan). This means you can cook for more than one person with it. If you want to turn it off, plug it out, because the one we tried turned itself back on while laying on the patio, even if it wasn’t supposed to. Also, it has a short cord and plastic legs so it may slide if not placed on flat surface. This hot plate is not the easiest one to clean, but if you do it carefully, with lifting it’s coil a little, it shouldn’t be a problem. Faster than others I've tried. Small, simple and lightweight, easy for carrying around. It has a power indicator light. Slippery, it’s not very stable overall. May turn on itself if placed on cold, remember to pull out the plug. Cuisinart single burner has cast iron plate for better endurance, and it works with more watts than previous one. Also, it’s not sliding all over the place while you are using it. “On” and “Ready” indicators are separated, which may help you if you need to put something directly on heated burner. However, you should probably watch out for the “on” light because it’s a little dim. The thermostat has six settings, which is a pretty wide range for this kind of product. Still, I haven’t noticed a distinctive difference between all six of them. It is a little slower but much easier to clean and more practical for transporting because it has a “coil-less” surface. You’ll won’t have to worry about damaging or detaching the coils when you pack it or move it. Cuisinart gives you a solid, sturdy product for your money. It allows you to cook on it for hours. You can prepare beans or any other dish that needs extended cooking. This feature may be worth spending a few more dollars because it is a rarity amongst other hot plates. On the other hand, money spent on this hot plate won't supply you with an appliance made for canning or pressure cooking. We've tried it, and it is simply not strong enough for that kind of food preparing. So, I repeat, think of products purpose and your needs before buying something. If those two things don't match, you should consider another type of cooktops. Produces steady and even heat. It has a thermostat for precise temperature regulation. It can cook for an extended period. “On” light is a little dim. Not strong enough for pressure cooking and canning. When it comes to design, Aroma hot plate is my favorite. It’s black, thin and elegant. Also, it is affordable and works fast, which is great if you are in desperate need of coffee or any other hurry. However, you should be extra careful with this one, because it has a thermal fuse located near the side of the device. This means you’ll have to maintain at least ten inches clearance around all of its sides, to prevent it from overheating and consequently failing. No dishcloths, towels or anything flammable near the hot plate. You may think it’s a problem, but the fuse is intentionally made to be sensitive to avoid setting itself and your household on fire. Event if it may seem differently, it is not made for self-destruction but self-preservation. I mentioned it is very fast, but it takes a long time to cool down, so you should leave it in a safe place to get cold, before storing it anywhere. The cover on the burner of the hot plate we tested, started to peel off. I’m not sure this happens in every case, nor if it could make some problem, but it makes the appliance look old, used and damaged. Money spent on this burner will provide you with diecast construction, compact design, four temperature settings and the safety feature that I mentioned before. It heats faster than others. It gets really hot and takes a lot of time to cool off. It has a thermal fuse which can turn off the product if you are not using it right. The cover on the burner starts to peel off after first use. The short cord may be a limitation. 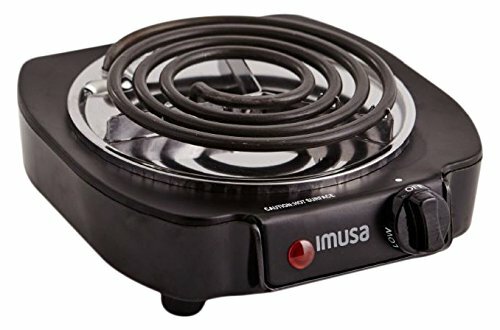 This electric double burner is another hot plate from IMUSA, and it has practically the same features as IMUSA single burner, only that it has two plates. The two burner hot plate gives you enough space for heating up two large pans (i.e., the Copper Chef XL and the Gotham Cooking Pan) at once, which is useful if you are preparing more complicated dishes. In comparison to others, both plates on this one work with the same number of watts, so you don’t have to think which one you should turn on if you only need one of them. Before you start using it, read the manual! This product should not be used for more than 60 minutes in 2 hours period. It is not made for long cooking, if that’s what you need, it’s better to consider other options than to overtax this one. Right side burner, of the one I used, wouldn’t turn off until you plug it out. Be careful with it, you don’t want setting anything on fire, or melting down your favorite utensils. Getting a double burner doesn’t mean a double amount of money spent. In this case, it is cheaper to buy one double burner than two single burners, if you’ve decided you need two products. You’ll get a hot plate that works with 1500 watts and allows you to cook more things at once! It gives you enough space for two large pans at once. Both burners work with equal energy. It is not as nice looking as I expected based on pictures. Right side burner won’t turn off until you plug it out. It has plastic legs, so it slides all over the place. 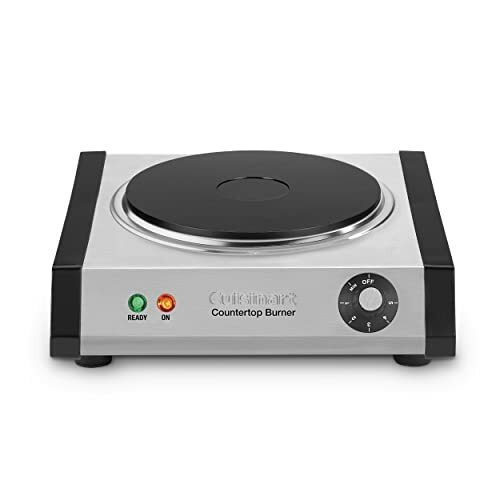 Cuisinart’s double burner is basically their single burner with the additional 500w plate. This plate has its own “on” and “ready” lights. In case you are forgetful, this is is a good reminder to turn off both plates. Still, plates are placed a little too close together so you might have a problem putting two larger pots on it, at the same time. It is quick and reliable, and it has rubber legs, so it won’t slide even if you are using it in a moving trailer. Both burners are strong enough to boil the water, but it is better to use the smaller one for keeping your food warm and other simpler tasks. My concern about this one is that its cord gets HOT! I do not recommend using it without your full attention paid on cooking, because this may lead to unwanted accidents. Cuisinart hot plate needs about 15 minutes to cool down, which is not an extended period, so don’t risk storing it in boxes or cabinets sooner than you should. You'll need to set aside a larger amount of money if you plan on buying this product. However, it seems like a sound investment because it gives you two burners that work with different power. If you, for example, only need to heat up something - turn on the 500w plate and save electricity. Also, in comparison to its “brother” Cuisinart single burner, this one allows you to pressure cook on it. One burner works with 1300w, other with 500w. It has rubber legs, won’t slide. You can pressure cook on it. Plates are a little too close together. It takes approximately 15 minutes to cool down. After we’ve tried all these great hot plates, the decision time has come. 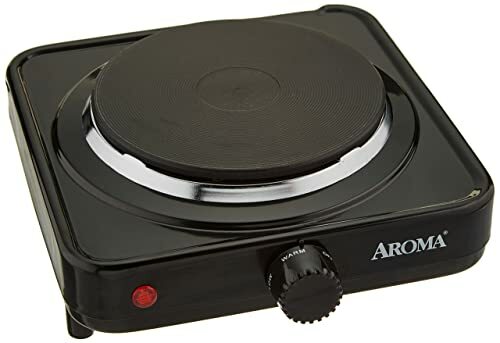 Me and my friend both liked the Aroma Housewares Single Hot Plate the best! Even if it is a tricky choice, I have to admit I like the thermal fuse situation. It makes me feel safe while using this product. Also, in comparison to others, this one has the prettiest design, which was vital to my friend. As she says, there will be people watching her using it, so it has to be fashionable. The only problem is that it has a short cord, but this can be handled with an extension cord. My final advice is, don’t go with high expectations but give the hot plate a chance; you might be pleasantly surprised! I purchased the Aroma single that is your favorite, but it just stopped working after 1 year. I wouldn’t buy it again.